I don't normally find myself that bothered when famous people die. I don't know them and they rarely mean a massive amount to me. But sometimes the person who has died is so unexpected or so young that it makes me stop for a moment. It's worse when they're someone I've actually always admired and looked up to, both in their professional capacity and in their other pursuits. One of those people was Linda Smith who has died at the horribly young age of 48. 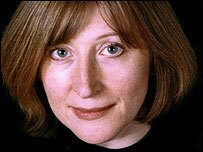 In 2002 she was voted the Wittiest Person In Britain by Radio 4. It was a well deserved title. Though not massively well known she was brilliant, absurdly clever and had an almost perfect comic delivery style. If I knew she was going to be on a radio show, or even a TV show though that was rarer, then I'd be there to listen. I liked her because she was never bitchy although she could be acerbic when she wanted, never moaned in her comedy, it was always pointing out the absurd but retrospectively obvious. She also was the sort of celeb we could do with more of. Her age was pretty much a secret until the obituaries, unusual as these days we even know how much celebs have had to eat for lunch, the saturation of culture makes the more private ones more admirable and interesting. She was president of the Humanist Society, and often made statements on the subject. She had principles. She had wit and intelligence. She was a real person. That's why I'm sad to hear she's gone. Linda Smith, you are a legend and I am happy to tag this entry as "Hero Worship". Today is a sad day for what we have lost but let's remember her for her devastating wit and one liners. If I ever come out with anything half as clever I'll be happy. Laughter is the best medicine, but that's not true if you've got facial injuries. Quite a nasty setback. Ever since cloaks and top hats moved out of fashion, you hardly ever see young women tied to railway lines.